The boys that I babysit love congee. Their mother brought some home from the local Chinese restaurant the other day and I had some for the first time in ages. 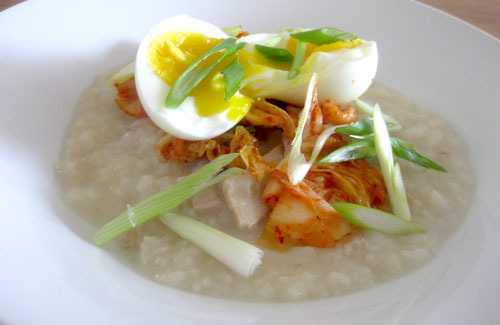 I forgot how comforting and delicious a simple dish of rice porridge could be. I love it when food pops back into my field of consciousness. It’s that moment of pure bliss when the flavours hit your tongue and every good feeling you ever had while eating that dish just comes rushing back. I think this is why almost half the world uses congee as therapy in a bowl. It’ll cure what ails ya. If you’re among those in the world to whom congee is strange and scary, I challenge you to make a batch. It will become your oozy, savoury, starchy comfort food too. Don’t buy congee, it’s so cheap and easy to make. If you have a slow cooker, set it the night before and enjoy for brekky. 3 eggs – if you can get preserved eggs, do. 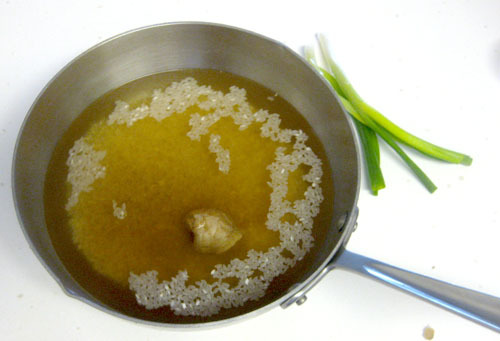 In a heavy based deep pan, combine the stock, water, rice, rice wine, soy and ginger with a generous pinch of salt. If you are using chicken or turkey wings add them too. Bring to a boil, boil for 5 minutes. Turn down to simmer, cover the pot and cook for at least an hour, probably 2. Check periodically and top up the water. The rice should have broken down into a soupy, creamy porridge consistency. Taste for seasoning and add salt if needed. If you are using pork, cut into chunks and pop into the pot halfway through cooking. You can’t overcook congee so don’t fret, congee is all about being slow and easy. Slice some green onion on the bias. To serve, peel the egg and gently break in two and lay it over the top. If you have preserved egg, chop it up into small pieces and stir in. Sprinkle generously with the green onion. Add some kimchi if that’s your bag.